Welcome to the first edition of The Action Network college basketball betting mailbag! Please email jordan.majewski@actionnetwork.com with your question(s), and I’ll do my best to answer them in an upcoming column. In analyzing KenPom advanced stats, which two or three stats would a casual bettor use to find an edge? Obviously, the books use these to set lines, as they are usually within a half point of the projected result. Majewski: Ken Pomeroy is the most influential person in college basketball in the past 25 years, and that includes coaches and players. He has completely changed the way we look at the game and analyze statistics. KenPom is basically the Gutenberg Bible of college basketball. If you’re a CBB fan, even casually, it’s an absolute must-have subscription. As for the statistics available on his site, I generally use all of them to make a “fingerprint” for each team. Within that fingerprint, I find turnover rate (both offensive and defensive), rebounding rate (both offensive and defensive), and adjusted tempo to be the most useful statistical categories. What are your thoughts on Evansville +5.5 (against Illinois State) and Eastern Washington +5 (against Portland State)? Majewski: Evansville has had a rough go of it with injuries. Boo Gibson and Dru Smith are both expected to be unavailable today at Illinois State (although Gibson has an outside shot at playing). Through all the injuries, head coach Marty Simmons has kept Evansville competitive, and the Aces have rattled off three straight wins. The Aces’ defense has been key, as Simmons’ constantly screening motion offense has just been missing too many key components throughout the year. The first meeting between the Redbirds and Aces was Ryan Taylor’s first game back from his foot injury, and he picked up right where he left off with 22 points. However, Illinois State’s combination of Phil Fayne inside and Milik Yarbrough attacking the rim with his 6-foot-6 frame were too much for the less athletic Aces. This has actually been the issue for Evansville against Illinois State for the last few years, as the Redbirds have now won five straight in the series. I can’t see Evansville sticking around for long in this one, as the athleticism deficit is overwhelming even when they’re healthy. I mentioned this in Thursday’s column, but PSU is forced to play their home games at Lewis & Clark College while their new gym is being finished. They’re drawing roughly 500 fans a night. What are your thoughts on the following matchups? Majewski: Let’s just go down the list here. Stanford runs a dual big, secondary break offense with Reid Travis and Michael Humphrey as the focal points. When you think about Stanford’s offense, think North Carolina. That’s a little troubling against an Oregon defense that ranks 23rd nationally in rim protection defense, but that’s predicated on Kenny Wooten staying on the floor. The athletic freshman big has the nation’s-third highest block rate, but also a way too high foul rate. Oregon’s morphing, trapping zone schemes can be a problem for young guards who are seeing it for the first time, which is certainly the case for the Cardinal. Colorado State is still extremely shorthanded, as guard Prentiss Nixon has been ruled out once again. That’s not ideal against anyone, but especially not against the best team in the MWC in Nevada. It’s a tough spot situationally for the Pack, as they’re fresh off a raucous win over budding rival Fresno State, and they have true rival UNLV at home next. Schematically, Larry Eustachy is one of the country’s foremost “underscreeners” on defense. He wants to entice jump shots and have all five players in position to grab the rebound. That’s always a bad idea against positionless pace-and-space Nevada, which can fire from deep with long, athletic shooters. Obviously the elephant in the room is how CSU responds to Eustachy being placed on administrative leave. I’m not sure how UC Irvine head coach Russell Turner will adjust his defense for the rematch with Cal State Fullerton. Turner went with his morphing 3-2 zone the first time around, and it worked for roughly 30 minutes. Then the constantly attacking CSUF backcourt figured it out, found seams, and it was a steady parade to the free throw line for the Titans en route to a comeback win. Unfortunately for the Eaters, their backcourt can’t stay in front of CSUF in man. Pepperdine simply isn’t quick enough to stay in front of Pacific’s relentlessly attacking guards in pick-and-roll. Per Synergy, the Waves grade out in just the fourth percentile in ball screen defense, and Damon Stoudamire runs a spread pick-and-roll, NBA-style offense at Pacific. The Tigers scored at will, registering 1.30 points per possession in the first meeting. There is some hope for the Waves, as that was Kam Edwards’ first game back from a nasty concussion, and he’s since found his sea legs. UC Davis head coach Jim Les has a problem. The Aggies are a better team when Chima Moneke isn’t on the floor. The problem for Les is that Moneke is the centerpiece of his offense. 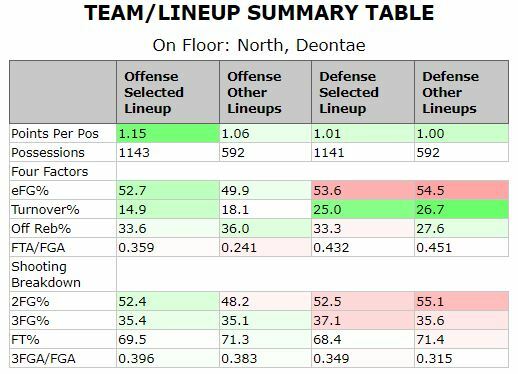 Moneke is a boon to UCD’s defense, but the offense has been better with him off the floor, per UCD’s efficiency splits via Hooplens. To wit, UC Davis rallied in the first meeting with Long Beach State when Moneke was saddled with fouls and AJ John was able to spread out the Beach defense as a stretch 5. The Niners, meanwhile, have to score in transition to be effective, and since the Hawaii debacle where the Aggies were routinely beat down the floor, Les has cracked down on the transition defense, and UCD has allowed zilch in fastbreaks in three games since. CSUN is the ideal offense for UCSB to play. UCSB has been outstanding offensively, scoring at 1.10 points per possession in Big West, the best mark in the league. However, head coach Joe Pasternack has tried to implement a pack line defense from his days at Arizona under Sean Miller, but with mixed results. Fortunately for UCSB, CSUN simply isn’t equipped to score against a high school pack line defense. It should be another game where CSUN struggles to crack 60.